The SureFeed Microchip Smart Pet Feeder is an innovative feeder designed for multi-pet households to ensure individual pets can naturally graze throughout the day without the worry of their food being eaten or contaminated. 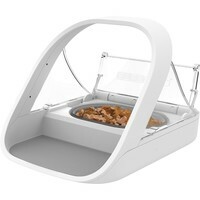 The SureFeed Feeder recognises a pet's unique microchip number or RFID collar tag and opens the lid automatically to reveal the food; closing again when the pet has finished eating. This unique system prevents overeating by individual pets and makes sure that prescription food is only consumed by the correct pet. The feeder features an integrated seal that helps keep food fresher longer and has a removable bowl, mat and lid for easy cleaning. It can also be personalised with different bowls and mats available in four colours.